An Australian hunter has begun combing marsh land in Hong Kong for a crocodile which has eluded the authorities since it was first spotted almost two weeks ago. John Lever, who works on a Queensland crocodile farm, is planning to lay bait for the beast and then wait in a boat, hoping the crocodile will be hungry enough to visit. He has said he can then try and grab the animal. "He's asked for chicken heads, a bamboo pole and a boat," a government spokeswoman said. The chicken heads should attract the crocodile's interest, she said. The hunt for the Hong Kong crocodile has captivated the territory and dominated newspaper headlines. "I don't know how to rate my chances at this point," Mr Lever told Hong Kong's English-language daily, the South China Morning Post, which has sponsored his visit. "Finding him is the easiest part. Getting close enough to catch him is the hard part. It requires a lot of stealth," said Mr Lever. 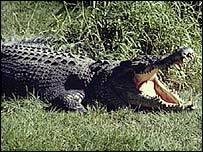 The crocodile, which is 1.2 metres long, is not native to Hong Kong. It is believed to have escaped from a home where it was kept as a pet, or a farm on the Chinese mainland. But the authorities fear the animal could harm someone, and they are determined to track it down. So far they have been remarkably unsuccessful. Teams of sharpshooters with tranquilizer darts failed to hit their target in front of the assembled media. A series of traps have also failed. On one occasion the crocodile managed to eat the food in a trap and slip away without getting caught. But officials say they intend the animal no harm. If its caught it will be sent to a zoo - no doubt as the top attraction. "A crocodile that refuses to give in"